Good evening Reign Nation! We regret to notify you that we have been informed that the Indy Crash will not be fielding a team for the 2019 season. Due to this, we will not be opening our 2019 season this Saturday. Our season opener will be April 20th on the road against the Grand Rapids Tidal Waves. Our home opener will be May 4th against the Columbus Vanguards. We will be publishing our full revised schedule tomorrow afternoon. In lieu of our season opener, we will be hosting a Meet & Greet event at Mojo's, 115 N. Erie St in Toledo on Saturday, April 6th starting at 7pm. There will be prizes, giveaways, and photo opportunities with members of the Reign. Good afternoon Reign Nation! Due to circumstances beyond our control, our 2019 WFA schedule has been adjusted. Please note that none of the home or road dates have changed. We will now be playing the Indy Crash at home on April 6th and the Columbus (IN) Vanguards on the road May 25th. There's only 41 days until we kick off the season, so let's get ready to #LetItReign in 2019! Meet, Greet & Train With The Reign! 3rd Annual Toledo Reign Trunk Or Treat! Good evening Reign Nation! We are teaming up with You First by Grant Services (YFBGS) for our 3rd Annual Toledo Reign Trunk or Treat! Reign players, staff, family and friends will be on hand to hand out candy and share information about our upcoming season. We encourage all kids to come dressed up in your Halloween costumes and have a great evening with the Reign! This event is FREE to the public, so feel free to join us on Friday, October 26th from 6pm to 8pm! The You First by Grant Services Airport Hightway Vocational program is located at 5455 Airport Highway Suite A (next to Chuck E Cheese). Reign at the 2018 Susan G. Komen Northwest Ohio Events! Pre-Season Training For 2019 Season! Good evening Reign Nation! 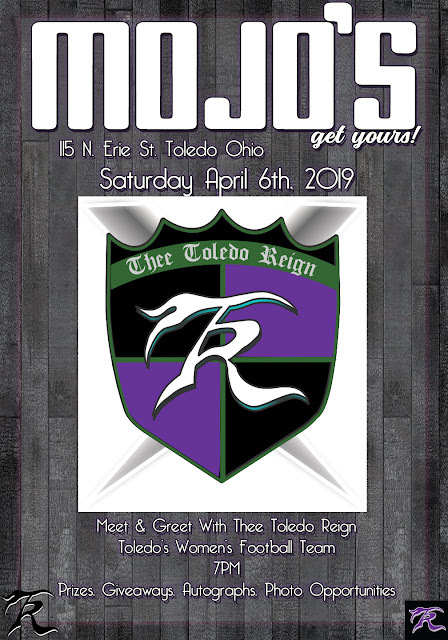 Thee Toledo Reign Women’s Tackle Football Franchise is looking for women 18+ years of age by April 1st, 2019 that are interested in becoming members of the Reign for the 2019 season! All skill levels and body types are welcome, and there is no experience necessary to become a member of the Reign. Our coaching staff will teach you the game of football and prepare you to successfully reach your goals. We have scheduled our first two Preseason Training sessions for Sunday, September 23rd and Sunday, September 30th. Both sessions will be held from 1-4pm at Go MAD Fitness Toledo (5215 Monroe St, Toledo, OH). Please bring a $30 non-refundable team registration fee, athletic clothing without rips or holes, tennis shoes, and something to drink. If you are interested in joining the Reign but are unable to attend either of the Preseason Training sessions, please fill out the “Join the Reign” form found on the side tab of this page or at the following link - http://theetoledoreign.blogspot.com/p/join.html. We look forward to seeing you at our Preseason Training sessions, and let’s get ready to #LetItReign in 2019! 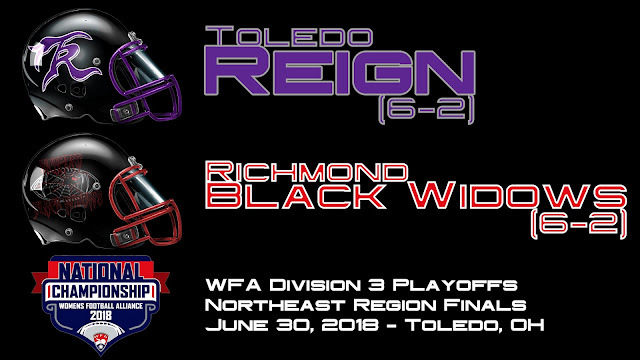 One of the goals of Thee Toledo Reign is to provide the opportunity for women to follow their dreams and participate in the sport of football. Thankfully, there are plenty of female youth athletes out there participating on their community football teams, and we’d love to feature them here! If you know any female youth football players and want to share their story, please have them email us at reignweb@gmail.com with the following details. Make sure to include some photos in their football gear! What do you like the most about playing football? How do you feel about playing a sport mostly played by boys? What would you tell other girls who want to play football? We are happy to support the female youth football players today so they can #LetItReign with us in the future! Grrridiron Girls Flag Football Camp! Good morning Reign Nation! We are very excited to announce that we are teaming up with Dr. Jen Welter at the Grrridiron Girls Flag Football Camp in Youngstown, Ohio on Tuesday, July 31st! Dr. Jen Welter is the first female to coach in the NFL, serving as a linebackers coach for the Arizona Cardinals in the summer of 2015. Dr. Welter had a highly decorated 14 year career in women’s professional football which included four National Championships and two gold medals as a member of Team USA in the 2010 and 2013 International Federation of American Football’s (IFAF) Women’s World Championship. At the Grrridiron Girls Flag Football Camp, kids ages 6 to 18 will learn skills like flag pulling, stance, snapping, throwing, catching, running routes, backpedaling, blitzing and covering. Toledo Reign players will be on hand to assist with teaching these skills to the camp participants. The registration for the camp is $40 and can be completed at the link below. Registration includes one-on-one coaching, a Grrridiron Girls Camp T-Shirt, and a Meet & Greet with NFL Alumni and Special Guests. Don't miss your chance to register TODAY for this unique opportunity with a true trailblazer in the world of football! Second Round Playoff Action Tonight! Get ready Reign Nation, we have Women's Football Alliance playoff football in Toledo tonight! Follow the event link below for more information, and get ready to #LetItReign tonight!